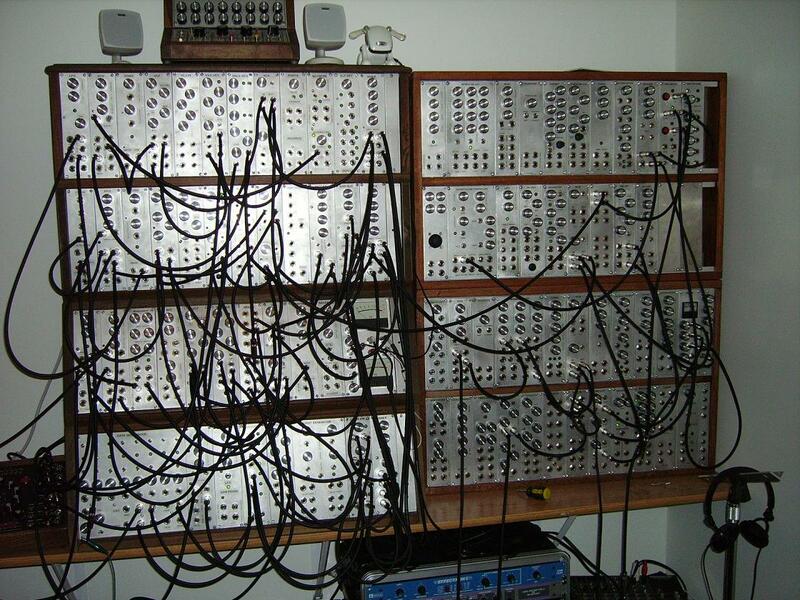 Here's the most recent picture of my Analog Modular Synthesizer as of January 2010. Every module has been built over the past three years. This is a rough 'Noodle' I recorder recently - It's all hands off - no keyboard, no knob twiddling. I just built the upper right hand 2 rows of cab - Just got to catch up with my backlog to fill it. I had been looking for a Moog Micro synthesizer for several years. 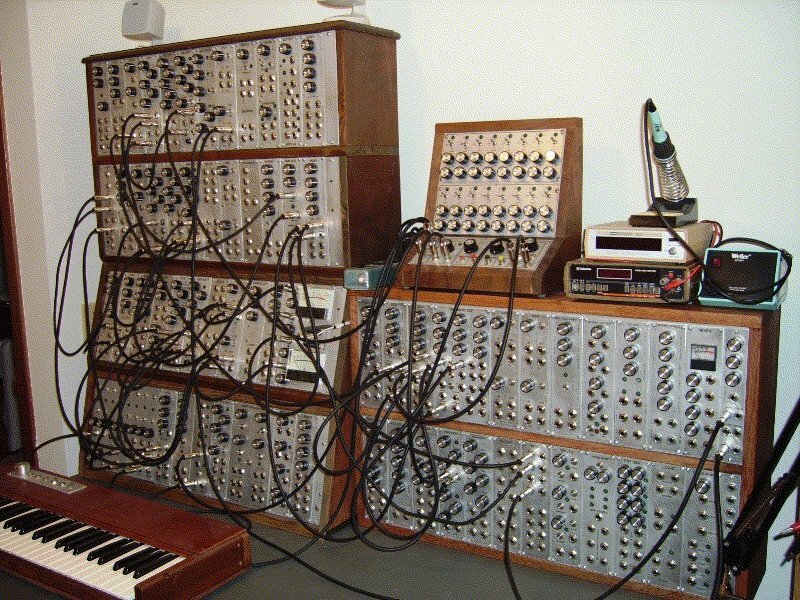 My interest in a synth was primarily to learn about analog synthesis. With my tech background I expected I could find one that needed repair, fix it up and then sell it when I learned what I wanted to learn from it. I finally found one for a couple hundred dollars on E-bay and purchased it. It was a mess – but some power supply work, changing a few pots, and a good cleaning gave me a useable Moog. It was fun – but I decided it would be great to have a sequencer to use with the Moog. A Google search for "Analog Sequencer" pointed me to several sites and I stumbled across Ray Wilson’s "Music from Outer Space". Ray’s site provided very nice circuit boards and instructions for building a nice 16 step sequencer, among other projects for building an entire analog modular synthesizer one module at a time. I ordered up the Sequencer boards and parts in late October of 2006 – and began to follow links into the world of SDIY. By the time I had completed the sequencer I had remembered how much I used to enjoy building electronic circuits as a kid. And I wanted to make more. In November of 2006 I ordered a VCO, VCF, VCA, and ADSR PC board from MFOS. In December 2006 I followed with another VCO, ADSR, LFO, VCF and Noise Cornucopia from MFOS. More boards followed in late December 2006, and I also began to build other circuits I found on the Internet on perfboard. The winter was spent building, mounting and learning to use the various modules. My initial case was in a four unit high rack with panels for each module – something like a Frac rack. As I continued to build I decided I wanted a more traditional look for the synth, and decided on a Moog Modular format in a wood case. Using wood I had on hand from an old church organ I made a couple racks that would hold 12 of my modules each. I scrounged some 1/8 inch aluminum from a nearby metal fabricator shop and cut my panels to size using a table saw. In March of 2007 I found the Electro-Music.com website. 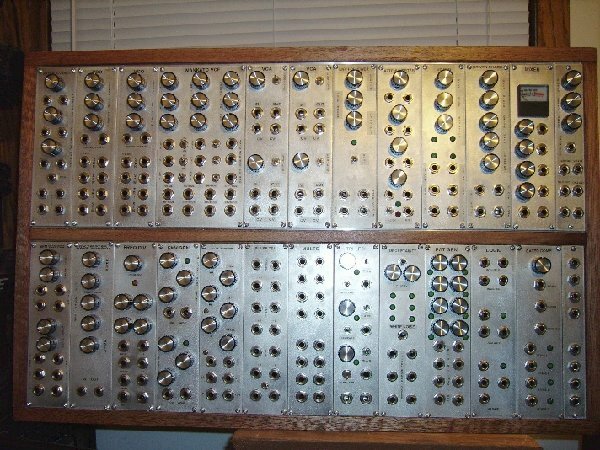 This website has an great community of Synth builders and designers - and enough unique circuits and PC board offerings to keep me busy building. This is the 2 row Cab on the Lower Right. The electronics for this cabinet were built in Winter of 2007-08 with the exception of the Pattern Generator and Synthacon VCF. 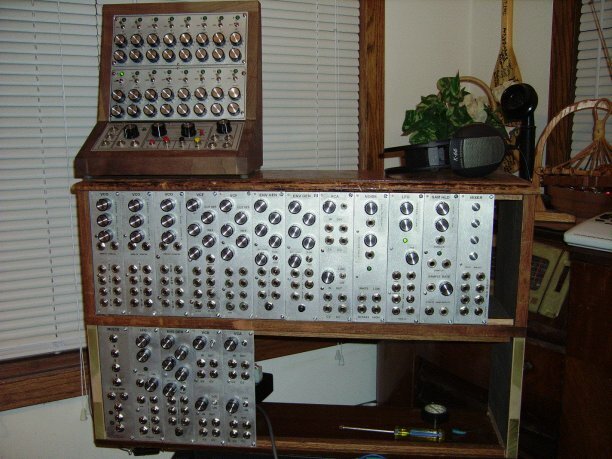 The MFOS VCO's & VCA's, Thomas Henry QFQ and Mankato VCF and Fonitronic Attenuverting Mixer were made with purchased PCB's - the rest were built from schematics shared on electro-music and around the web. 1in/4 out CV Dist & 3 Passive Attenuators (Normalled to CV Dist), 2 MFOS VCO, Thomas Henry Mankato VCF, 2 MFOS Dual VCA, Polyfusion 2044 copy (Env Follower/Gate Extractor), Fonitronic Attenuverting Mixer, Thomas Henry VC QFG, Ian Fritz Driven Double Well Chaos, 4 in/2 out Mono Mixer, repackaged RatShack Reverb. The module panels are 8.5 by 2.25 inches by 1/8 inch aluminum. Labeling is clear Dymo. Mahogany probably isn't the best choice for durability - it gets 'dinged' pretty easy - but it's easy to work with, inexpensive and I like the look. Two 4 foot by 7 inch by 1 inch pieces of mahogany were used for the frame, and a 1 inch by 3 inch piece for the center divider. 3 1V/Octave control voltage inputs. 1 Linear control voltage input. Accepts external clock and external start pulse. Simultaneous outputs with and without portamento. Forward, Back, and Reset controls. Simultaneous High-Pass, Low-Pass and Band Pass Filter outputs. CV Control of Panning Rate. The Quadrature Function Generator produces 4 simultanious sine wave voltage outputs 90 degrees out of phase. Switchable 4 or 8 stage phase shifter. Variable feedback ranges from mild swooshing to raucous mind bending. Two external control voltage inputs. Pseudo stereo output when 4 stage and 8 stage outputs are used. On-Board LFO produces Triangle and Ramp waves. Phase angle is modulated in a logarithmic fashion. 8 Stages of phase shift result in a barber pole effect. Sample Rates from .05HZ to 1KHZ. Glide Control To Slew Between Samples. 1 mS to 20 second Attack, Decay, and Release times. Classic ADSR envelope shape and functionality. Gate and trigger inputs permit retrigger after Attack complete. Comparators on gate and trigger inputs. A Voltage Controlled Low Pass Filter Based on the SSM2044 Chip. Simple 4 step sequencer based on the CD4017 decade counter chip. It uses a 555 based Clock and CGS Trigger to Gate converter. Portamento is the 'glide' from one note to another. 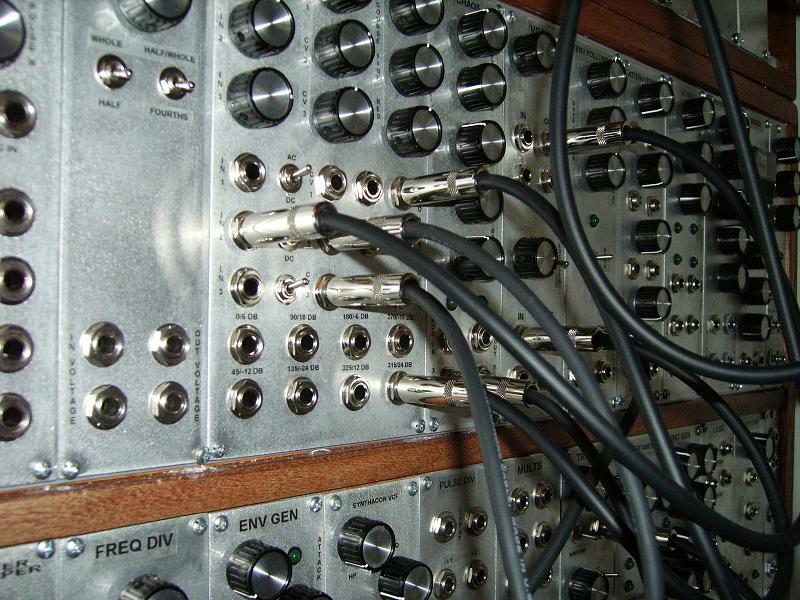 The Ring Modulator takes two signal inputs and outputs a sum and difference of them. Often used to provide 'clangorous' sounds such as bells. The slope detector is an event-driven gate/trigger generating device. It monitors a control voltage, and responds according to what that voltage is doing. If the voltage is rising, the slope detector gives a "gate" output (approx. 5V) on its "rising" output. Likewise, if the voltage is falling, the slope detector gives an output on its "falling" output. The duration of this gate signal depends on the incoming CV and the setting of the sensitivity pot. When the CV is remaining constant, the "steady" output activates. These gate signals can be used to fire envelope generators dependent on the action of the CV, for example opening a filter when a melody is rising in pitch, and closing it when the melody is falling in pitch. It can also be used to generate gate signals from LFOs, envelope generators, to advance sequencers etc. The sensitivity pot allows the slope detector to work with either relatively fast events, like the edges of a square wave pulse train, or very slow events, such as the sine output of an LFO being used to drive filter/phaser sweeps. Basic 4 input mono mixer based on a TL084 Op Amp. 4 Summed outputs. 4 input Dual mono mixer with 2 outputs per channel, plus Stereo Headphone jack. This has two sections, each with four inputs and one output. The peak section would output the highest of the four inputs, while the trough section would output the lowest of the four inputs. The peak section was often used for combining gates from a sequencer, but either section could used to combine waveforms, CVs or envelopes in unexpected ways. The "WoggleBug" is a random voltage generator. It is a continuation of "smooth" and "stepped" fluctuating random voltage sources pioneered by Don Buchla. The core of the circuit is based on the Buchla Model 265 "Source of Uncertainty" module. A utility bandpass filter for creating artifical instrument resonant cavities etc. vary the response from linear to log. The Simple Wave Folder - The effect it produces is not like unlike that of the Serge middle wave multiplier - harmonically rich waveforms that can be swept for filter-like effects. It MUST be fed a triangle or sine wave to function properly. This is a bizarre little LFO that produces a wide range of pseudo random effects. The Sawtooth Doubler and Sawtooth Phase are included on the module. An 8-step sequencer designed for controlling pulsed or gated events, for rhythm and percussion. 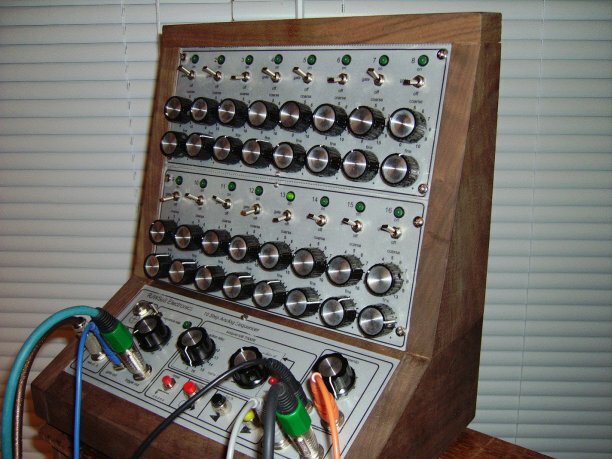 The CV Adapter convers it to a traditional eight-step control voltage sequencer. Feed a clock signal into the input of the pulse divider. The divided signal is available simultaneously for each output. If running at audio frequencies, feed some of these to a mixer or other signal processing device. If running at low speed, try driving two different sequencers at the same time from different divisions. Try feeding the /8 output into the reset - this will force all to synchronize to a /7 count, with the lesser divisions becoming "syncopated". An AND gate could be used to control a clock signal. If the second input is LOW, no clock signal passes. If the second input is high, the signal passes unimpeded. Of course, there are a lot more things that can be done with the logic gates. For example, the /6 and /7 outputs could be ANDed together, and that would give a pulse every 6 x 7 (42) clock pulses (i.e. 1 pulse immediately the pulse divider is reset, and the second 42 pulses after that etc.). At lower speeds it can be used to step a sequencer a certain number of steps or retrigger an envelope shaper. The output pulses are quite narrow when the specified component values are used, and would best be described as trigger pulses in synths that distinguish gates from triggers. Increasing some component values will give longer gate like pulses. This module is the embodiment of the classic twin-T circuit in a form that is suitable for connection to modular synthesizers. It contains 4 separate drum sounds, each individually triggered, as well as adjustable harmonic content. This is a circuit adapted from the Sandin Image Processor. The original circuit was used to give "solarized" effects to video signals. The basic idea is to use diodes to split the input voltage into three sections - plus, minus and "near zero". Each section is then run to a scalable follow/invert circuit. Since the breakpoints are fixed by the diode voltage drop, an input "span" control allows adjustment of the breakpoint relative to the input voltage range. The output "Gain" control then allows boosting the signal back up to the 10 volt range. This module is a "tribute" module, based on the Steiner-Parker Synthacon VCF. Unlike the original, this version allows signals to be fed into all inputs simultaneously. If the same signal is used in all inputs, the result is reminiscent of a phaser. The real fun starts when you feed different signals into each input, then you get a frequency based "interpolating scanner", where panning between different sound sources is possible, though also subject to the frequency at which they are running. Each of the filter type inputs has its own level control. The ALL input is also affected by these level pots as it mixed with the individual inputs prior to the level controls. If using only a single input, it may be better to feed the signal into the ALL input, and adjust the level pots to select LP, BP or HP, rather than changing the patch cord between the specific input jacks. Four boolean logic elements, two inverters an OR gate and an AND gate for the processing of gate and trigger signals. Dual 4 step pattern generator with CV outputs. Input two clocks to a side and complex patterns are formed based on the binary relationship of the clocks at any point in time. Produces a Trigger output at each change. This module takes a Clock source and a Signal source as inputs and creates 4 gate outputs in a pattern. The Frequency Divider converts a monophonic analog signal applied to the "IN" jack into digital pulses which are divided by two sections of CMOS digital counters. One section, controlled by the 4 pots mix divisions 1, 1.5, 2, and 3 together to form complex sub octave waveforms. The output signal is present at the lower "OUT" jack. The second counter section, controlled by the rotary switch on the top of the module, divides the input signal by 6 thru 10. For example, a 440 Hz signal divided by 10 would result in a 44 Hz signal at the two "Pulse Out" jacks. An envelope follower takes an audio input and converts it into a control voltage. This control voltage will rise and fall with the overall volume of the input signal. The louder the input, the bigger the output of envelope follower. The EFG has1 CV outputs available Switchable between Fast, Medium and Slow. The Fast is useful for tracking fast moving cymbal and hi-hat patterns. The slower one is more useful in processing single instruments. By using the CV output to control VCAs and VCFs it is very easy to create synchronised patterns that keep in perfect time with a drum machine or other musical input. Another feature of the EFG, is the provision of a gate extractor. This part analyses the peaks in the music and creates a gate type signal in time with these peaks. This can be used to trigger envelope generators in time with an external drum loop or click track. A Gate Threshold rotory control enablesyou to get clean gate signals from all sorts of input material. This OTA core VCO is based on the National Semiconductor application notes. It has one one-volt per octive input, sync and three control voltage inputs for modulation. Featuring native triangle and square outputs. The sine output is derived from the tri using a system 100 style tri to sine converter. There is a classic OTA VCA also on this board just because it's always nice to have lots of VCAs around. 4 input mono mixer with 2 outputs.